The Sony ICF-2010 portable shortwave receiver at ZL1NZ, was used aboard the yacht Oceana from 1986 to 1994. 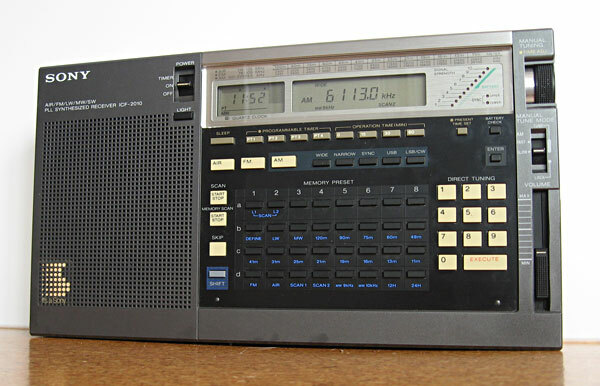 The Sony ICF 2010 was a sophisticated portable shortwave receiver introduced in the mid 1980s. Known in some countries as the ICF 2001D, the radio is still very highly rated by shortwave listeners. I bought this radio new, about 1986, in Vancouver and installed it on my 38-foot yacht Oceana. I mounted it inside a large flat Tupperware container screwed to the bulkhead at the chart table. When not in use, the radio would at least be protected from any spray that blew into the cabin. Time checks from the National Bureau of Standards station WWVH in Hawaii were essential for adjusting my wristwatch. Since we relied on celestial navigation, a time error of more than +/- 1 second could seriously affect our position finding. Marine weather broadcasts. These came in 3 forms: plain language SSB, plain language Morse, and International Analysis Code (Fleet Code) which was also sent by Morse but which contained all the data needed to draw a weather map. News and entertainment via shortwave broadcast stations. Listening to the various radio nets on both the marine SSB channels and on amateur radio frequencies to hear where other yachts were and what sort of conditions they were experiencing. The Sony ICF 2012 proved a good choice for us. Tuning steps were no finer than 100 Hz which meant that SSB and CW reception was sometimes less comfortable than I would have liked. The frequency display was off by 300 Hz from the day I bought the radio. Might have been worth taking it back, but I learned to automatically reinterpret the dial. I still have this radio along with its original accessories and box, and it still works fine. You can find lots of information about the ICF 2010 (or ICF 2001D) online. Some enthusiasts have improved the radio’s selectivity using Kiwa filters.